I grew up in a musical family. My Father was a church organist and conducted the local choir. I still remember my first ever performance, singing for The Salvation Army at the age of 4 with him proudly backing me on the piano. My Mother, on the other hand, was a big Country music fan. We’d tune in every week to the Country Show on our local radio station, Mum singing along and me pretending to play guitar! After watching me for some months, she surprised me by presenting me with a real one! I’d spend hours in my bedroom practicing as well as singing into the mirror, hairbrush in hand, largely to Olivia Newton-John songs. 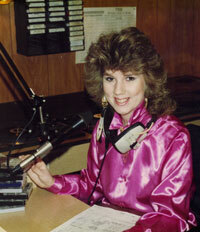 By the time Grease hit our screens in 1978, I thought I WAS Olivia Newton-John!!! Although born in Edinburgh, I grew up in nearby Kirkcaldy, and attended the same High School as Prime Minister Gordon Brown. 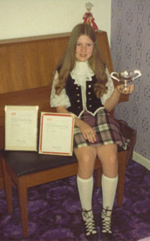 As a teenager I studied Piano and Oboe and joined the School Orchestra. Recitals and choir rehearsals became the norm. 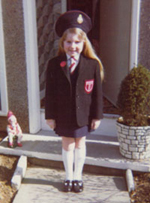 I always wanted to learn Tap Dancing but my Mum sent me to Highland Dancing instead! I felt a bit self-conscious in my kilt but it certainly kept me fit! In 1981, I was lucky enough to perform as soloist in Portland, Maine for the centenary celebrations of “Christian Endeavour”. Audiences of thousands came from all over the world. It was quite an experience for a young girl from a small town…one I’ve never forgotten!! In 1985, without telling me, a friend entered me in a competition to win a chance to present a one-off radio show on a local station called Radio Tay. Well, it proved to be the start of the next 12 years of my life. I won the show and it went so well that I was asked to join full time. I was even lucky enough to be given my own Country Show. Imagine being paid to play the first Shania Twain record! I also had a weekend love show called “Feelings”, which allowed me to indulge my passion for romantic songs. Michael Bolton, Lionel Richie, etc…If you had a broken heart, I had a song for you! After a few years, I was lured away to the Mediterranean Island of Malta to become Breakfast show presenter and Programme Controller of Island Sound Radio. During an interview, I happened to mention that I loved country music and used to sing it all the time back home. This led to a surprise invitation to sing at Malta’s annual Country Festival. After that I was hooked! I formed my own band and was soon topping the bill at many local events. Demand was such that I recorded my first album in a tiny back room studio in Mosta. It was called “Somewhere Between” and, to my surprise, one of the tracks reached No.15 in the European Media Services Chart. This was a fun time. I was a local celebrity. I would appear on TV, open supermarkets, turn on Christmas lights, give out awards, I even had a sausage named after me! 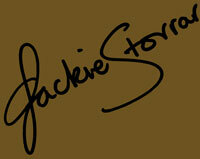 I kid you not…”The Jackie Storrar Breakfast Sausage”. One of my fondest memories was being invited by The British High Commissioner to sing at a V.I.P. event for the officers and crew of the Royal Navy carrier “H.M.S. Illustrious”. Not to be outdone, the American Navy asked me to perform for the 3000 troops of the “even bigger” carrier “U.S.S. Kearsage “. All those men in white uniforms…! However much I loved my time in Malta, after 4 years, it was time to move on. I would watch the ships leaving Grand harbour at sunset and think to myself “I’d like to do that!” I had found out about a company looking for onboard singers, so I flew to London for an audition. Much to my delight, I got the job and, in 1998, I joined my first cruise ship. What I‘d thought was going to be a job singing at the piano in a cocktail lounge turned out to be a full-on job in the production team. I got the shock of my life! They made me sing AND dance. Feathered head-dresses, mirrored slingbacks, I even had to dress up as a giant yellow furry dog! Not even my childhood experience of Highland Dancing could prepare me for that! It was whilst working on one of these ships that I met the man who would prove to be the most influential person in my life. He was a musician called Steve Thiebault. Having just returned from working in Branson (USA), he understood my love of country music. We decided to form our own duo act called “Foreign Affair”. Together we’ve played in such diverse places as The Red Dog Saloon in Alaska, The Millennium Celebrations in Havana (strangely held in 2001), Rick’s Bar in Casablanca, The Hard Rock Café in San Blas (a tiny set of Islands off the coast of Panama) and the Rio Carnival in Brazil, to name just a few of the 42 Countries we have visited! It was during this period that he persuaded me to take my songwriting more seriously. One of the first things we wrote together was a song called “Sometimes Love’s Just Not Enough”, which I am very pleased has made it onto my new album. This was a very productive time; we’d write every day and perform every night. It was a great proving ground. 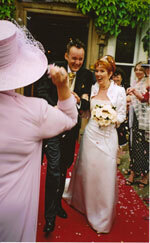 Writing, living, and working so closely together it probably won’t surprise you to hear that after a romantic proposal in Hawaii, we were married in a Castle in Scotland on 7th June 2003. People flew in from all around the world. It was the perfect day. You might be tempted to think that that’s the end of the story, but you’d be wrong. Actually, it’s just the beginning. In 2005 we were playing in a Bar in Spain when a man, who’d been sitting in the corner quietly listening, came over and introduced himself as a record producer. His name was Pete Ware and he was to be the next person to play an influential part in my career. He’d enjoyed our performance but particularly liked our original songs and was convinced of their commercial potential. 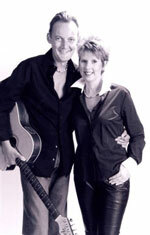 Meeting him was to lead to the release of my latest album “Cross The Border” on Parrothouse Records (UK). For me now, this is where the story really starts…?